In the past few years, the role of social media during emergent incidents has become increasingly more prominent. 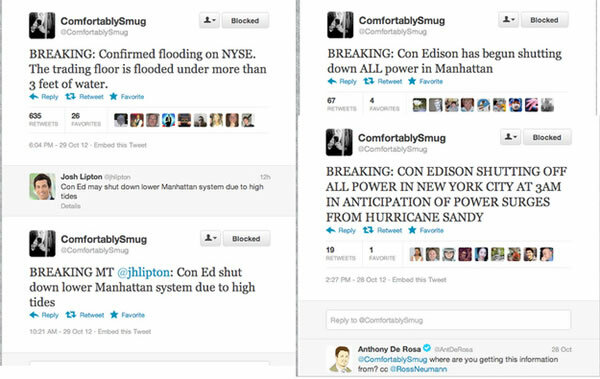 This past October, as super-storm Sandy struck New York City, several tweets provided cause for concern. “BREAKING: Confirmed flooding on [New York Stock Exchange]. The trading floor is flooded under more than 3 feet of water”, said one tweet. “ Con Edison has begun shutting down all power in Manhattan”, read another. Those tweets, along with dozens of other posts and rumors, turned out to be completely false. 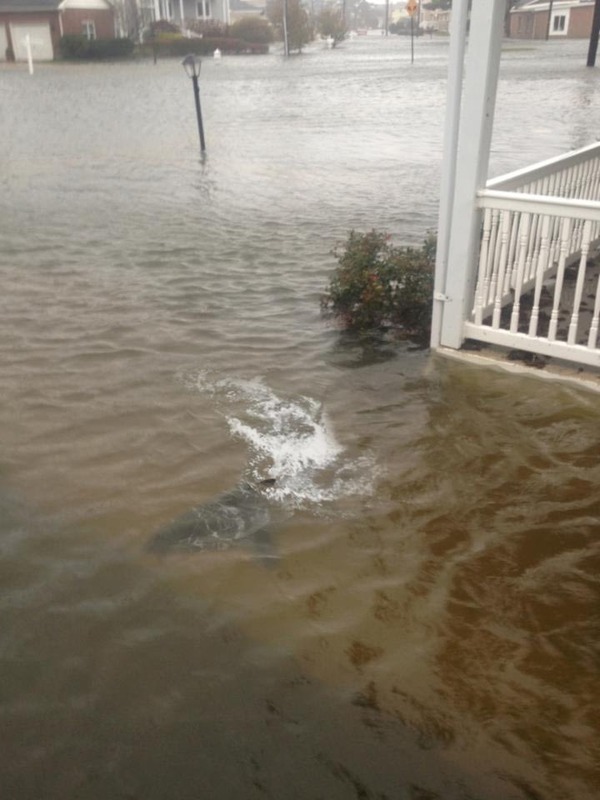 Another example, documented by the Chicago Tribune, included “fake images… including a picture of a storm cloud gathering dramatically over the Statue of Liberty and a photoshopped [image] of a shark lurking in a submerged residential neighborhood”. For most social media users, sharing a picture over multiple systems and platforms is as simple as tapping a few buttons, the speed at which data can be shared within a global network of users can facilitate the spread of hoax messaging. Upon initial inspection, the quality of some doctored photos are stunning and even the sharpest skeptic can mistake a fake picture as genuine. Fortunately, visual examination is only one method of verification. Reverse image search engine TinEye, provide a better gauge of image authenticity. By uploading or linking the suspicious image to http://www.TinEye.com, users are able to see where that image, or a similar version, has been posted in the past. In a few clicks, communications and situational awareness teams can quickly debunk a bogus picture post. When discussing one of the mitigation techniques deployed by FEMA, Mr. Herrick noted that “…after many discussions this transformed into the ‘rumor control’ movement that FEMA received praise for as the response continued. This campaign was used on social media via Twitter and Facebook through the use of the tagline RUMOR CONTROL and in the creation of the rumor control page on http://www.FEMA.gov.” The website simply provides a synopsis of current myths or scams alongside FEMA rebuttals and actual, helpful information. For example, FEMA stated: “…recent blog posts and social media traffic expressing that FEMA is out of bottled water. This is false.” The FEMA entry further clarifies that “We are providing water to our state partners for distribution. For New York locations and times of food and water distribution centers and daytime warming centers, visit www.nyc.gov”. 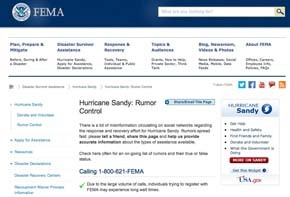 FEMA’s rumor control strategy was simple and effective at identifying rumors, disproving them and providing factual information in their place. 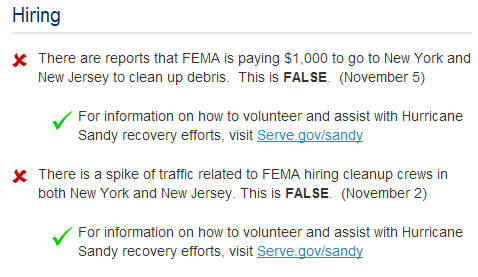 Speculations and questionable reports were posted on a designated website ( http://www.fema.gov/hurricane-sandy-rumor-control ); falsehoods were clearly marked with a red “X” while facts were marked with a green check-mark. An added benefit to the system, was the ability for media outlets to vet citizen-reports, which in turn, further assisted in quashing misinformation and preventing accidental rebroadcasts of false accounts. It is an unfortunate reality that some individuals will take advantage of the vulnerable and needy following a crisis. Numerous scamshave been well-documented and FEMA has been equally dedicated in their efforts to prevent their recurrence. For instance, one scam profiled in a FEMA press outlined how “a resident was asked by phone to send the caller, posing as a FEMA representative, a $250 check to process a $5,000 disaster assistance check from FEMA.” In fact, the caller was not associated with FEMA and the entire episode serves as a warning to others to be on the alert for scam artists masquerading as disaster assistance volunteers and staff. 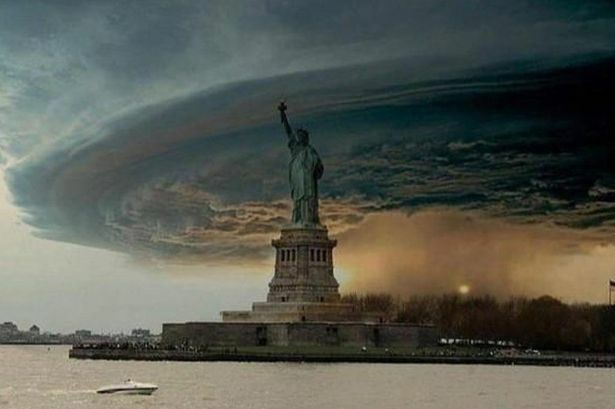 Super-storm Sandy is one of, what will undoubtedly be dozens of, disasters that will test our rumor control tactics. For local emergency managers, it can be heartening to see partners at the Federal level leading the charge to develop and test these new methods. As technology evolves and the public becomes increasingly reliant upon mobile devices and social media for real-timenews before, during, and after an incident, so too must our ability to quickly combat misinformation and communicate the truth.